"We are dying as a people and a nation." 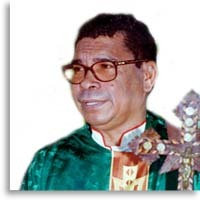 Bishop Belo wrote to U.N. Secretary-General Perez de Cuellar, calling for a referendum on independence for East Timor. "The Indonesian invasion and military occupation of Timor has denied the possibility of the Timorese people to express their feelings and this, perse, is an abuse of human rights contrary to the UN Charter", he told the Catholic Bishops of Indonesia, before publicising many specific atrocities. In 1975 Indonesia invaded East Timor. The result, according to some Catholic Church sources and Amnesty International, has been the death of between one hundred thousand and two hundred thousand people. In 1991 television footage was smuggled out the country. It showed the massacre of hundreds of civilians in the Santa Cruz cemetery in Dili, the capital of East Timor. A wave of outrage swept around the world, but indiscriminate arrests, torture and "disappearances" are said to still occur. As guerrilla war continues to be fought in the mountains, and in the cities, especially in Dili, one voice speaks out with a clarity and a spirituality that cannot be silenced. It is the voice of the Apostolic Administrator of the Catholic Church in Dili; the voice of Bishop Carlos Filipe Ximenes Belo. Carlos Belo was born in the village of Waiikama, a village in Vemasse, Baucua on the 3rd of February, 1948. He became a priest and was still a relatively unknown figure when appointed Bishop of the Catholic Church in East Timor in 1983. Although 30,000 people attended his consecration, some sections of the community questioned his membership of the Salesians, a minor religious order; others suspected him of being conservative young man amenable to Indonesian influence. History was to prove them very wrong. Bishop Belo has been isolated and harassed during crackdowns by the Indonesian authorities. His life has been threatened many times. He continues to document, denounce and publicise around the world the oppression of his people. He also works closely with the young people and students of East Timor. Steadily, he advocates freedom for his people, to be won by their strength of sprit, by peaceful means. He was awarded the Nobel Peace Prize in 1996. His fellow Laureate was Ramos Horta, the roving Ambassador for an independent East Timor and a spokesman for the jailed guerrilla leader Xanana Gusmao.